Richard Gott. The Cosmic Web - Mysterious Architecture of the Universe. Princeton University Press, 2016. Space: there's a lot of it about. It's all around us, and even inside us. It seems to go on forever, absolutely infinite. But what exactly is it? We naturally tend to think of Space as nothing, emptiness, void or vacuum. However, it is an established scientific fact that a totally empty vacuum is an impossibility. 'Nature abhors a vacuum' is the principle first enunciated by the philosopher Aristotle and now confirmed by modern science. Quantum mechanics shows that the void is constantly bubbling with energy particles coming into existence and disappearing almost instantly. Perhaps the most amazing fact of all is that everything comes from nothing, literally. Current thinking is that for every billion packets of energy or 'matter' coming into existence, only one remains while all the rest are cancelled out by packets of 'antimatter'. As if all that were not mind-boggling enough, it is now orthodox science to believe that the entire universe exploded from a point very much smaller than a single atom, about 13.8 billion years ago. In this book J. Richard Gott attempts to show how random fluctuations on the sub-atomic micro level at the time of the 'Big Bang' gave rise to the uneven distribution of matter in the form of galaxies and clusters of galaxies. His approach to this highly complex subject is shown in the first sentence of his Preface: "Galileo once said: 'Philosophy [nature] is written in that great book which ever is before our eyes - I mean the universe...The book is written in mathematical language, and the symbols are triangles, circles and other geometrical figures.' So it proved to be with the arrangement of galaxies in the universe. To understand it would require geometrical language." That language is 'topology', defined as 'the study of geometric properties and spatial relations unaffected by the continuous change of shape or size of figures.' There can be no doubt that the author was born with a brilliant brain and a propensity for topology and mathematics. Gott describes how, when only 18 years old, he discovered a group of "intricate, sponge-like structures made of triangles, squares, pentagons, or hexagons – some of which neatly divided space into two equal and completely interlocking regions." This became his high-school science project, which he presented at a local science fair in his home city of Louisville, Kentucky. "Surprisingly," he says, "this would later play a role in my own path to understanding the arrangement of galaxies in the universe." And so it proved to be, as "Great clusters of galaxies are connected by filaments, or chains of galaxies, in a sponge-like geometry, while the low-density voids are connected to each other by low-density tunnels; this entire structure is now called the cosmic web." One thing Gott cannot do, nor anyone else for that matter, is to explain how the Big Bang occurred in the first place. Despite the quirk that Gott's name means 'God' in German, he does not possess supernatural knowledge, despite his brilliance. The riddle of that First Cause, and its nature, may be beyond the reach of any kind of scientific instrument and measurement. Having said that, I must admit that Gott has a great mind, perhaps one of the greatest in the field of cosmology for over thirty years. He excels at higher mathematics and parts of his book are completely baffling. You know that this book is written by a hands-on scientist and not a science writer. It is not that he appears in certain places to deliberately obfuscate the subject, but rather that the complexity of the concept itself results in challenging sentence structures. Take this sentence, for example, on the subject of inflation immediately following the Big Bang: "These effects create a small tip in the fluctuation spectrum as a function of scale relative to the constant value predicted by Zeldovitch." And then, a few sentences later: "In principle, inflation gave us both the ham and the eggs." 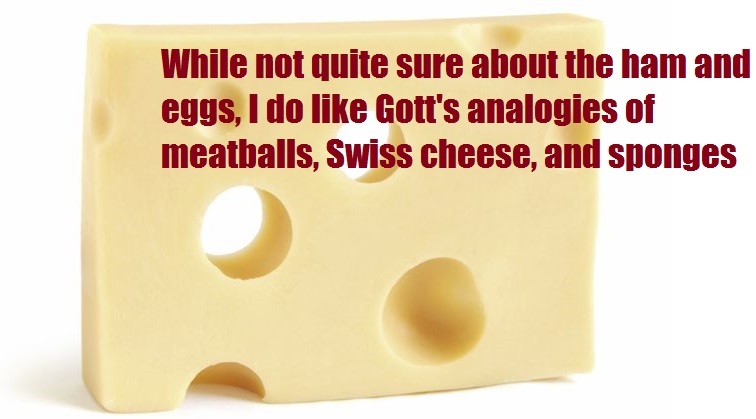 While not quite sure about the ham and eggs, I do like Gott's analogies of meatballs, Swiss cheese, and sponges, in relation to the agglomeration and distribution of matter in the universe. It is natural for the human mind to perceive patterns that correlate impressions of the micro world and the macro universe. My own casual observations have been similar, for example to see the shape of a revolving spiral galaxy in the froth on the surface of a cup of coffee and clusters of galaxies in the foam on a bubble-bath. Sure enough, Gott also discusses 'Bubble Universes': "I proposed that we lived inside a bubble universe and that our universe was just one of many bubbles. Our bubble universe would continue to expand forever. Meanwhile, outside our universe, other bubble universes would continue to form in the endlessly inflating, high-density sea." But what about the Big Bang? How could this notion of bubble universes, in a truly infinite 'multiverse', be reconciled with that? "The bubble looked like an ever-expanding, inflationary Big Bang universe. We, looking out in space and back in time, could see only our own bubble and the smooth inflating sea that produced it. We could not see the other bubbles." It is worth mentioning that Gott is a Professor of Astrophysical Sciences at Princeton University. He is quite well known for proposing how a time machine might be constructed using hypothetical cosmic strings. In a previous book, Time Travel in Einstein's Universe: The Physical Possibilities of Travel through Time (2002) Gott grapples with the knotty philosophical problem of whether it is possible to go back in time. The difficulties are obvious, as shown in the 'Grandfather paradox'. If a man could go back in time and killed his grandfather, would that not wipe out his future existence? In that case, how could he ever have existed at all? Questions such as these show how Physics at the highest levels becomes Metaphysics, and then Philosophy. Through thought-experiments Einstein famously worked out his General Theory of Relativity, in which space and time are directly related. Gott says : "This theory explained gravity in a revolutionary way, as the result of curved spacetime. Einstein's equation showed how the 'stuff' of the universe (matter, energy and pressure) cause spacetime to curve." Gravity is, of course, vital to any cosmological theory of "the architecture of the universe" as the force that holds everything together. However, we now know that there is a repulsive energy that counteracts the effects of gravity. 'Dark energy' is the name given to this remarkable substance that has a repulsive effect. Incredibly, it is estimated to comprise 70% of the energy content of the universe, and 'dark matter' accounts for about 25%, yet what they are made of is still a mystery. Remarkably, only 5% of the known universe is made up of ordinary matter. Nothing in cosmology rightly deserves the adjective 'ordinary', and so it is with the kind of matter that we are familiar with. To our senses it is definitely solid, but in the quantum world it is virtually empty space. Above our heads the stars and constellations seem fixed. Yet, as Gott explains, it appears that the universe is in a stage of accelerated expansion, doubling in size every 12.2 billion years. This creates what is known as an 'event horizon', beyond which we cannot see. All of this knowledge is relatively recent. It was less than a hundred years ago that Harlow Shapley discovered that our solar system's location is in an outer arm of a galaxy that we call the Milky Way, but we still knew nothing of other galaxies. Some, such as Andromeda, had in fact been observed as fuzzy images, and were interpreted as 'nebula', clouds of dust and gas. Then Edwin Hubble discovered that there were countless other galaxies and that the whole observable universe was expanding. By 'red shift' comparison of light sources we could see that the further away they were, both in space and time, the faster they were accelerating outwards. Knowledge has continued to grow at an exponential rate until now. As new discoveries are made, new questions arise. In his final chapter ‘Dark Energy and the Fate of the Universe’ Professor Gott speculates on the ultimate end-time. After an unimaginably vast period of time, the stars will all have burnt out. Beyond that, "galactic-mass black holes will evaporate by Hawking radiation and blink out in a burst of glory". If you happen to be still around, "it would be like watching static on your television" as you watch thermal radiation from the event horizon. While all of this speculation is interesting, it is as much use as science fiction. The most bizarre theory within the final chapter is that of ‘Boltzmann Brains’. Here is how Gott introduces the concept: "Once in a great while – once in every 10^10^70 years - you will see something called a Boltzmann brain; that is, something as complicated as the human brain will appear at random from the thermal radiation. 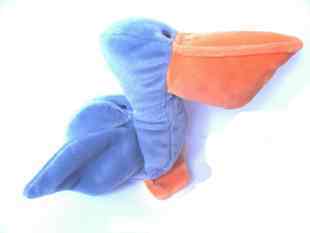 I have argued (Gott 2008) that although you may see such a brain in the distance if you wait long enough, it would not be a self-conscious intelligent observer – because the thermal radiation is observer dependent." Notice that Gott makes an impossible assertion as if it were fact. The fancy term, named after a German physicist's exotic theory, and an impressive-looking specific number (very, very big), are presented as if solving the greatest riddle of existence. It does nothing of the kind. If anything, it proves one thing, particularly with the author's self-reference, that there is another kind of 'inflation' in process: Gott's ego. He really must stop pretending that he knows everything and has the formula to solve any problem. His self-importance runs right through this book. Did you know he's in the Guinness Book of Records? 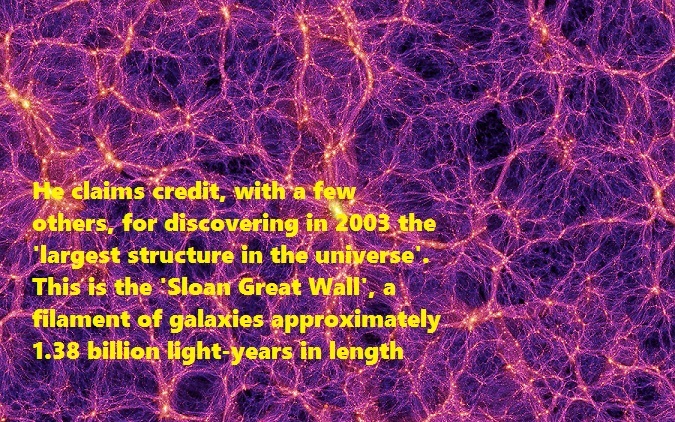 He claims credit, with a few others, for discovering in 2003 the 'largest structure in the universe'. This is the 'Sloan Great Wall', a filament of galaxies approximately 1.38 billion light-years in length. Other apparently larger 'structures' have since been found. Murphy (2016) would argue that the question of how consciousness and self-awareness arose in the cosmos is the ultimate mystery that physics will never solve. Possibly we can find it by looking within, exploring our own consciousness and spirit. Maybe that is the God-essence that has no beginning and no end. By all means check out 'Boltzmann brains' for yourself. See if it makes any sense to propose that intelligence, or self-awareness, can spontaneously arise out of chaos. But then again I did set out at the beginning of this review by asserting the truth that everything comes out of nothing. What do we really know? I agree with Socrates: 'True knowledge exists in knowing that you know nothing'.